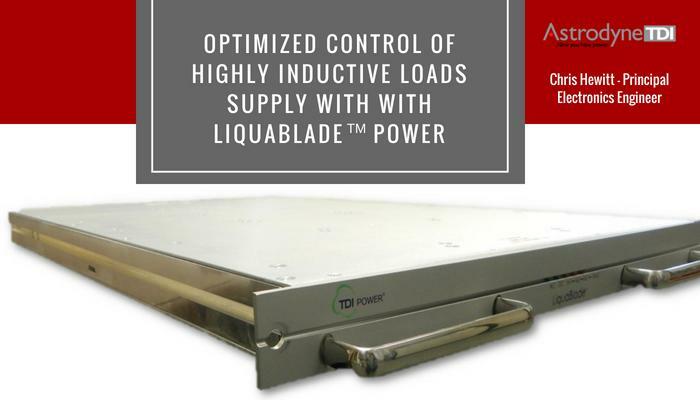 Astrodyne: "Optimized Control of Highly Inductive Loads with Liquablade Power Supply" » HHP Associates, Inc. Interested in the role that Astrodyne TDI engineers play in developing some of the most precise and accurate electronics? Particle beams are utilized in such diverse applications as lon implantation techniques used in semiconductor manufacturing and proton therapy used in the treatment of cancer cells in the body. These beams require the use of large DC electro-magnets that generate strong magnetic field vectors. These magnetic vector fields are used to steer particles in three dimensional spaces towards a specific target. The magnitude of DC current supplied to the magnet coils controls the field strength, which is then in turn used to control beam deflection. The coils of large DC electro-magnets are highly inductive in nature and pose challenges to power conversion equipment being used to provide DC current to the magnet. Inductances in the range of 4mH are not uncommon for this equipment, and with DC currents in the range of 100Adc to 1000Adc.